Shotokai Karate differs much from Shotokan (the most widespread Karate) in that it rejects competition altogether , feeling that it compromises Karate itself. Kata are generally the same as other forms of karate, although Shotokai often emphasizes smooth flowing movements rather than the sharp snappy movements of other styles. Kumite (sparring) in some Shotokai schools is practiced with full strength attacks, and is tightly controlled in terms of who is attacking and defending and the attacks that can be performed in order to reduce the chance of injury. Practising of the core fundamental techniques. These 3 training methods should be practiced in the same manner, i.e. how you move block and attack should be exactly the same in Kumite, Kihon and Kata. Kata brings all core techniques together and combines them into flowing movements. 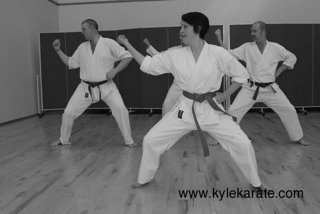 Timing is synchronised to the person at the front of the Kata group.